Are we missing any? Contact us! Looking to pass a resolution in your City or Town? We recommend this one. 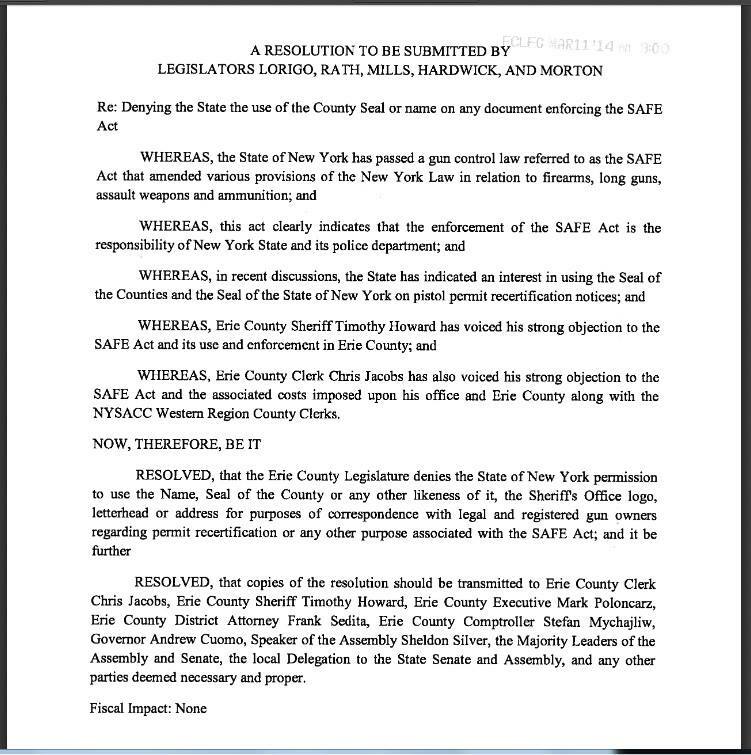 We have a separate page for resolutions prohibiting New York State from using County Seals / Names / Logos in SAFE act related communications. Its really cool watching and participating in all the creativity we, the grassroots, have unleashed in opposition to the #NYSAFE act. While I’ve been busy with work (notice the lack of posts here on the site? Thankfully I have people to help me out on the FaceBook page), a very cool #MoneyBomb for Rob Astorino was started! 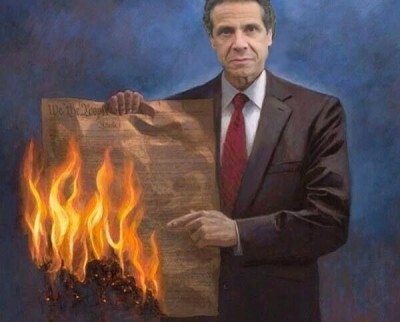 I have some really bad news — really bad for Andrew Cuomo! Which means GREAT news for you and me. A group of grassroots folks pulled together a Social Media Blitz that is now spreading like wildfire. It was launched on Facebook four days ago and has already raised more than $41,500.00 in PLEDGES! (2) Then head on over to (http://ROB4NY.com) and see how much has already been PLEDGED in just a little over three days. All you need to do is click on the orange PLEDGE button. Fill in the fields accurately and pick the amount that is right for you. Do you have to pay it now? Nope – you don’t CONTRIBUTE until D-Day or June 6, 2014). (3) Finally – 34 days from now is D-Day and the day this MoneyBomb comes due. Go to http://RobAstorino.com and click on the DONATE button and contribute the total amount of any Pledges you made via this MoneyBomb. Cool, huh? If you like Astorino (I do, he’s been vocally opposing the so called SAFE act, even though RINO GOP leaders like Skelos wish he’d keep his mouth shut), then head on over to the site and make a pledge! 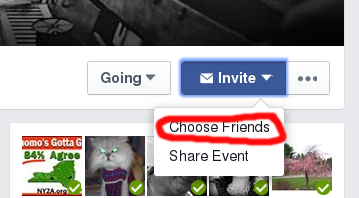 Then, click ‘Invite’, and ‘Choose Friends’ from the drop-down menu. Next choose as many friends as might support your second amendment rights (or stand up against Common Core, or don’t like corruption, etc — there’s lots of areas where Cuomo is bad and Astorino is great). Click, send. That’s it, you’ve done your part to spread the word. If your friends do likewise then attendance will grow exponentially, and we’ll astound the naysayers and be well on our way to getting a governor who will stand up for our rights instead of treading them under foot. KINGSTON >> State officials will be prohibited from use of the official Ulster County seal for any purpose under a resolution that began as opposition to the way gun laws were tightened without public comment. The restriction was adopted during a county Legislature meeting Tuesday, with the final resolution coming after a Democratic caucus that had lawmakers rejecting sections that would have prohibited state use of the county’s name or address. “We can’t tell (the state) not to use the name of Ulster County,” legislative attorney Cappy Weiner said. CHENANGO COUNTY – New York State has officially been denied use of the Chenango County seal on correspondence relative to the locally contested Secure Ammunition and Firearms Enforcement (SAFE) Act. Members of the Chenango County Board of Supervisors on Monday unanimously adopted a resolution prohibiting the state from using the county name, seal, letter head, or address for purposes of correspondence with legal and registered gun owners. In each of these lists, provide the name of the entity and whether the resolution or statement was in favor of the SAFE act, in opposition, or neutral. The Executive Chamber has conducted a diligent search for the records you request. Although we do not possess lists containing the information you seek, we located eight hundred seventy-one (871) pages of resolutions and official statements that respond to your request. You may access the records here: https://www.hightail.com/download/elNLRGwzQVNRR2RjR05Vag. 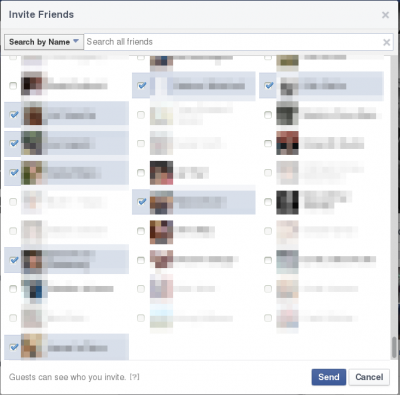 Please note that this link will expire after thirty (30) days. To the extent you are not satisfied with this response, pursuant to Public Officers Law § 89(4)(a), you have thirty (30) days to take a written appeal of this determination. You may make an appeal by writing: FOIL Appeals Officer, Executive Chamber, State of New York, Albany, New York, 12224. Embedded scribd document coming soon. For now download here: https://www.hightail.com/download/elNLRGwzQVNRR2RjR05Vag. WHEREAS, the Town Board of the Town of Clarkson wishes to go on record with respect to the New York Safe Act and its present provisions, so as to encourage the New York State Legislature to address all of the above issues with respect to the act as it is presently enacted and to encourage amendment and revisions to such act to address the legitimate concerns of all citizens of the State who are interested in the subject matter of the act. SECTION 1. By the adoption of this resolution, the Town Board of the Town of Clarkson does hereby encourage and support the representatives of the Town of Clarkson in the New York Legislature to address all of the outstanding and unresolved issues as set forth above and to amend or revise or otherwise act upon the New York Safe Act in such a manner so as to resolve the same in the best interest of the constituents which they serve. The Board of Supervisors voted recently to deny the use of Columbia County’s seal in correspondence related to the Secure Ammunition and Firearms Enforcement Act, to eliminate any alleged endorsement. 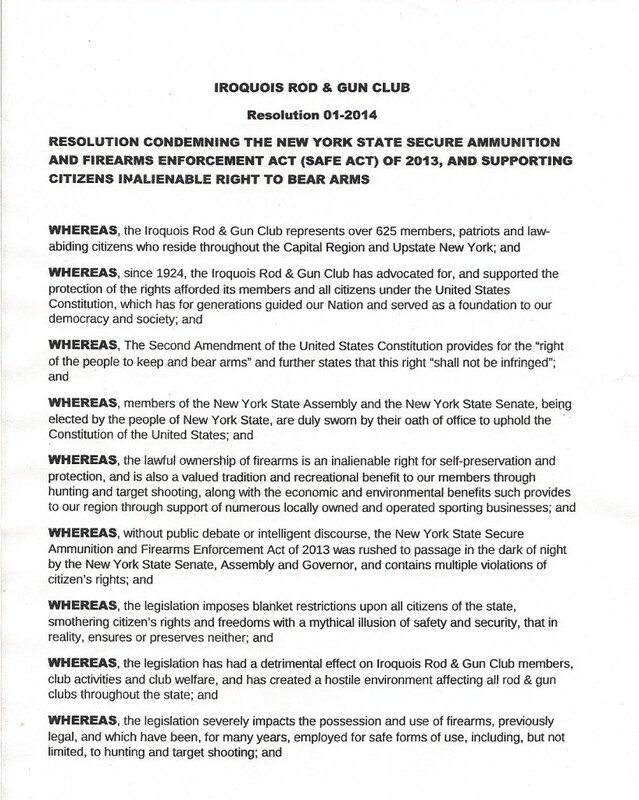 Iroquois Rod & Gun Club Resolution Condemning the NYS SAFE Act 0f 2013, and Supporting Citizens Inalienable Rights to Bear Arms. Passed unanimously by the Iroquois Board and General Membership March 18, 2014. The board also formally denied the state permission to use the Fulton County seal or the seal of its sheriff’s department, for “purposes of correspondence with legal and registered gun owners regarding permit recertification or any other purpose” associated with the new Secure Ammunition and Firearms Enforcement Act of 2013, or SAFE Act. 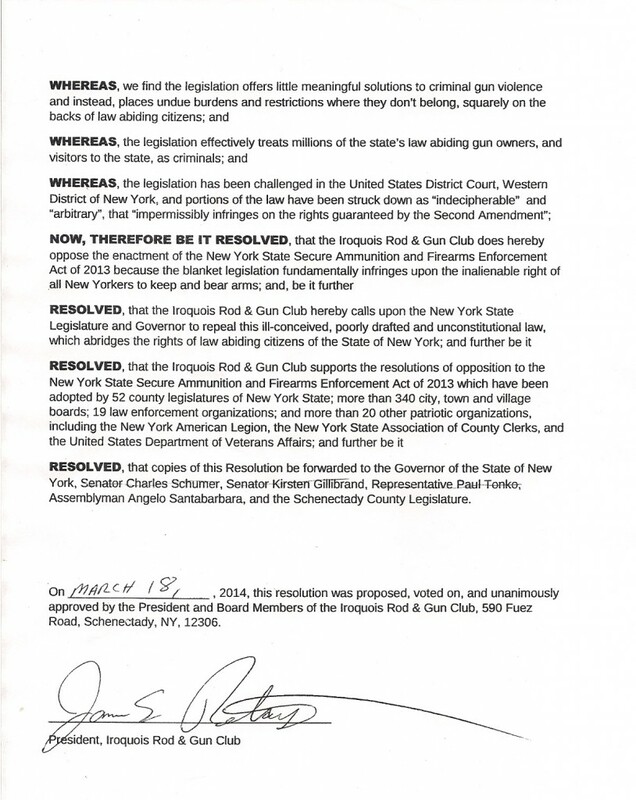 RESOLVED: That copies of this resolution should be transmitted to the office of the Governor of New York State, the Superintendent of the New York State Police, New York State Senator Joseph Griffo, New York State Assembly Representative Anthony Brindisi, New York State Senator David Valesky, New York State Assembly Representative Claudia R. Tenney, New York State Assembly Representative Ken Blankenbush, New York State Assembly Representative William Magee, New York State Assembly Representative Marc Butler, County Executive Anthony Picente, Oneida County Sheriff Robert Maciol, Oneida County Clerk Sandra DePerno, Oneida County Court Judge Michael Dwyer and Pistol Permit Assistant Daniel P. Sullivan and all others deemed necessary and proper.